Defenseman P.K. 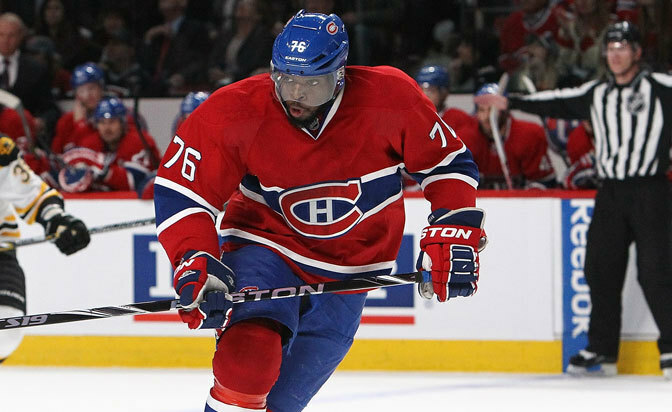 Subban reiterated that he intends to sign with the Montreal Canadiens long term as his arbitration hearing approaches. "Obviously I remain adamant on remaining in Montreal and being a Montreal Canadien, and not just for a long time but hopefully for the rest of my career, and be a lifer there," Subban told Breakfast Television in Toronto earlier this week. "I really enjoy playing there." Subban, 25, earned $3.75 million, with a $2.875 million NHL salary-cap charge, in the final season of a two-year contract. He was the NHL's fifth-highest scoring defenseman with 53 points in 82 games and led the Canadiens with 14 points in the Stanley Cup Playoffs, averaging 27:26 of ice time per game. The restricted free agent and the Canadiens have an arbitration hearing scheduled for Aug. 1. Negotiations are ongoing. Subban spent Saturday at the RBC Canadian Open at Royal Montreal. "I'll answer one question about the negotiation: It's been kept pretty quiet the whole time and it's going to remain that way until a deal's done," he said, according to The Canadian Press. "As of right now, today, I'm sitting here and trying to just enjoy the day, just not thinking about anything." The Canadiens avoided arbitration with Lars Eller when the 25-year-old center agreed to terms on a four-year contract Thursday reportedly worth $14 million. "He deserves it," Subban told the CP. "He's played well and he's a big part of our team." Subban won the Norris Trophy in 2012-13 after scoring 38 points in 42 games. In 284 NHL games, he has 42 goals and 167 points with a plus-10 rating. "I've made some great friends," Subban said. "We have a great working relationship, and not only that we've had a lot of success since I've been there. We hope it continues, but at the end of the day I have to leave that to my agent to get a deal done that's suitable not only for myself but for the hockey club."